pacaeropress.com > Categories > Identification Forum > What is this airplane??? 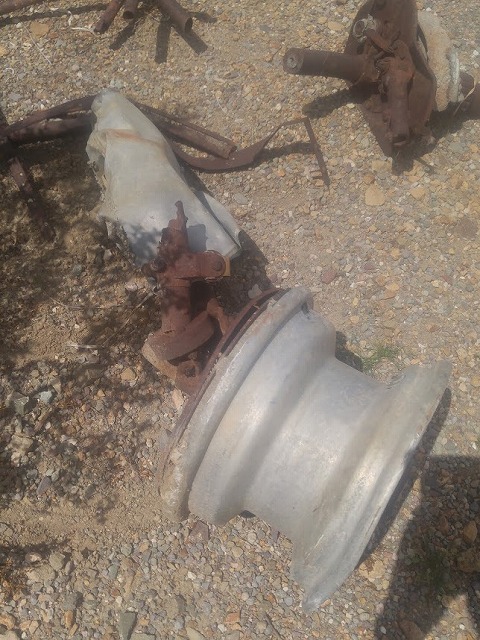 I visited Nelson, NV couple days ago for hiking with my friend and found very old aircraft flame by the road. 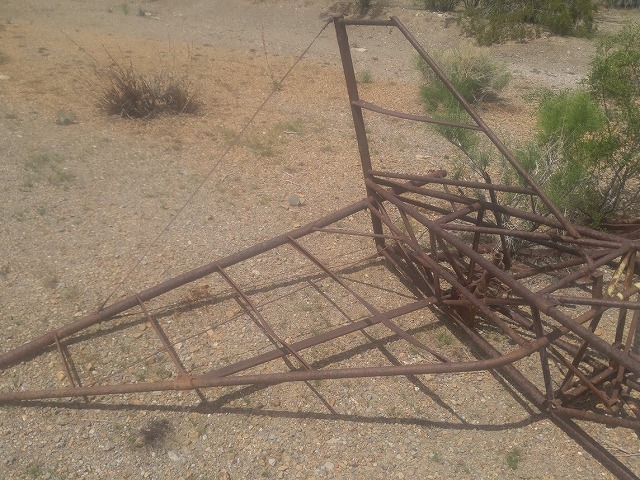 Took few pics of it and posted on FB Aviation Archaeology group and asked if someone can figure out which aircraft is it. Unfortunately, didn't get any good answer from them. So, I went back today and took many pics of it. Then drove down the dart road near the wreck for couple hundred yards and walked around the area where Garmin Topo map showing the "Air Strip". 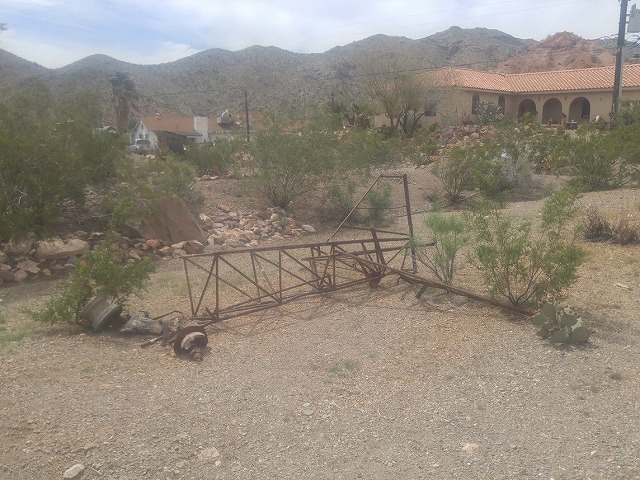 Actually, this "Air strip" is just a half mile straight dart road on the dry wash.
And, I found rusted "RPM aviation oil can" and few oil filters on the ground by the road. 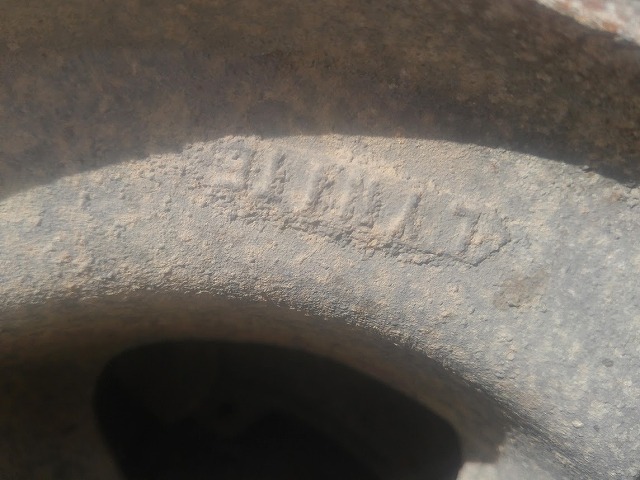 Back to the wreck, I examined the wheel and found "LYNITE" letter. 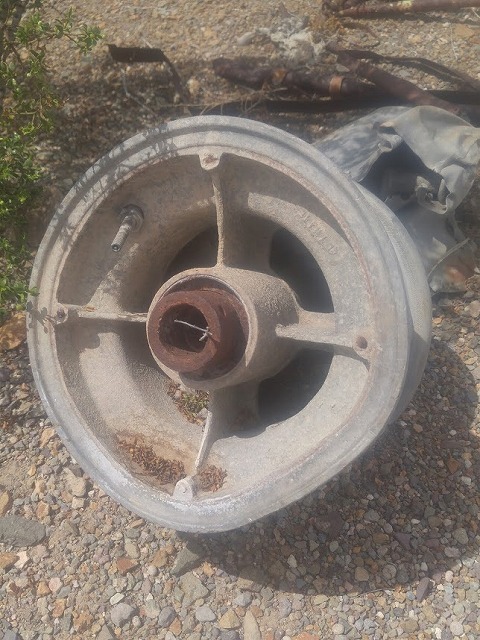 "Lynite" was aluminum casting Wheels and Pistons company started in 1914. 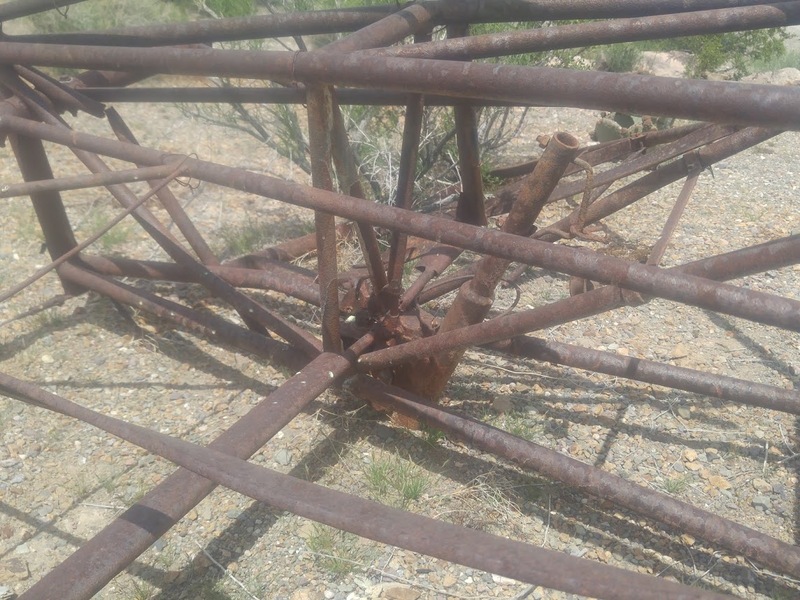 I found 1933 "Lady Southern Cross" (that is rebuilt from Lockheed Sirius) and 1933 Lockheed Vega was using the same aluminum wheel. But, couldn't find any other. Then, I examined the horizontal stabilizer mechanism and found that was "Stabilator". Looks like whole horizontal stabilizer was movable. I don't think Lockheed Sirius and Vega was Stabilator plane, so this wreck can be different model. I talked to couple of local residents (20+ years) and they said that one guy who used to live by there fly the airplane and used the dart road as air strip. But, the guy had passed away more than 10 years ago. Maybe that was his airplane, but not sure. So, what do you think about this airplane? I bets it's something like a late-40s or 50s Aeronca, Bellanca or Taylorcraft. Doesn't match a Cub. 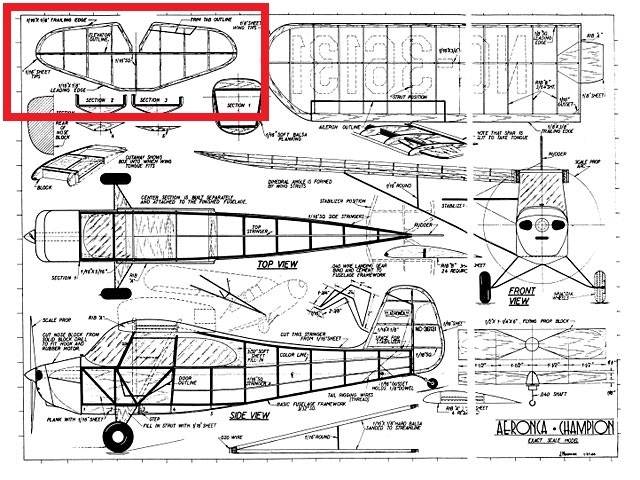 The Aeronca 7 horizontal matches (see attached) a little bit, for that first bend on the leading edge root. But your rudder is much more rakish. Maybe a later model Champion or similar. The horizontal stabilizer bracing wire is in the right place and makes me think it's not a biplane (would have more bracing wires? and the rudder would be bigger, rounder). 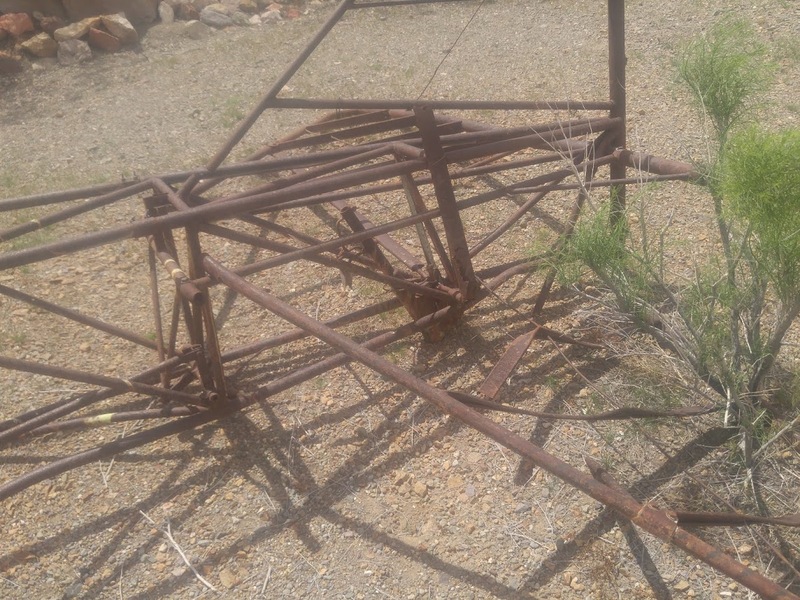 I wonder if the mechanism is not for a "stabilator" but a steerable tailwheel. 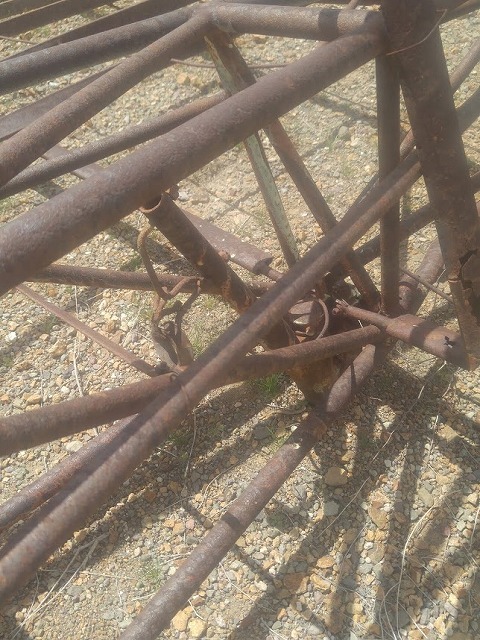 That might be the tailwheel in your photo. 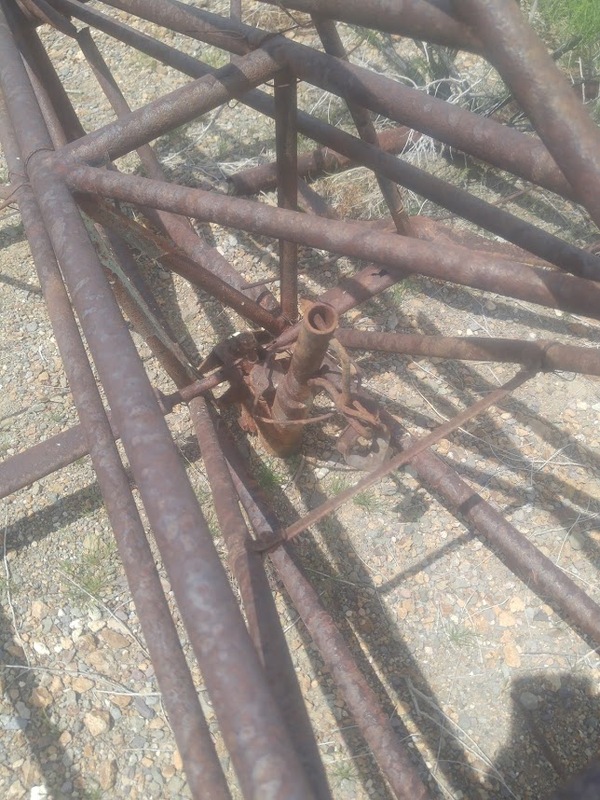 The hub has 4 bolts which matches some Aeroncas. I couldn't find an exact match. Wow! Chris, you are right and I was wrong. 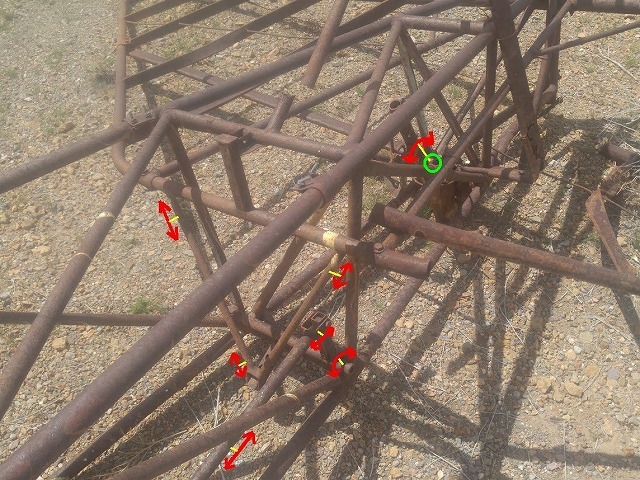 After you mentioned about mechanism of "stabilator", I re-checked the pics and found that I was completely wrong. The horizontal stabilizer was attached to the main fuselage and it was not movable. 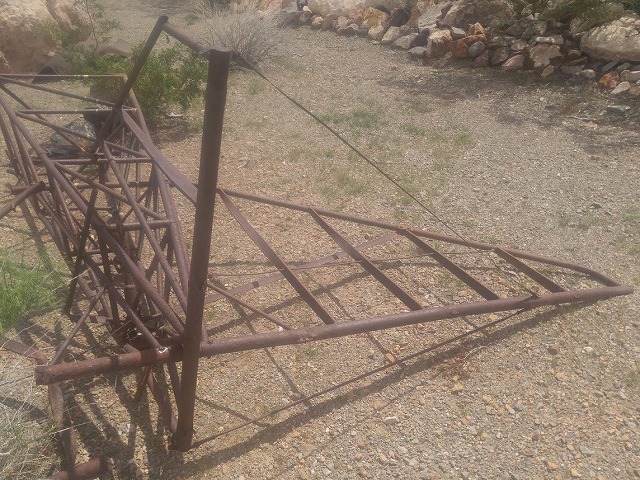 That means the mechanism is for elevator or rudder or tail wheel. 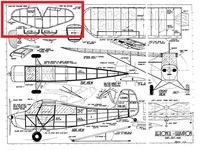 All the detail look a like Aeronca, except one thing. 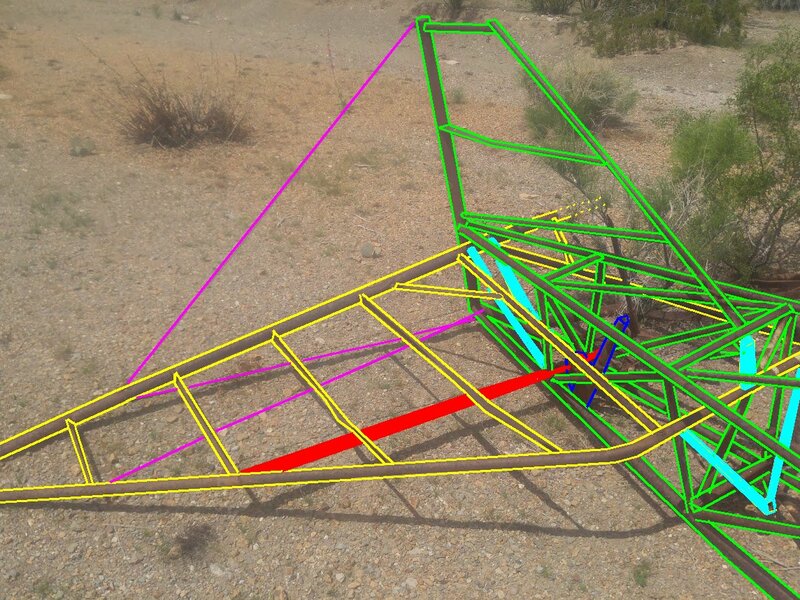 I couldn't find the Red parts in the following pic which holding the horizontal stabilizer from the bottom of the fuselage near tail wheel (blue parts). Anyway, your insight and explanation was the best answer I got so far. There are almost 8,000 members on Facebook Aviation Archaeology group and none of them could lead this close answer. Guess most of them knows modern aviation archaeology but vintage one. Even someone says "Carnival float" and other says "Yard art". 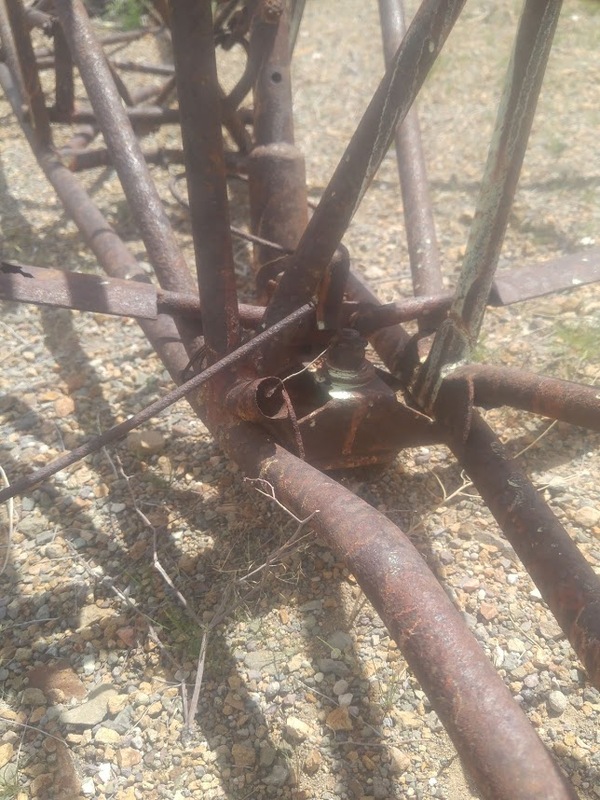 Why the "Carnival float" and "Yard art" needs such a complicated mechanism, Aviation oil and oil filters??? LOL. Thank you Chris, I really appreciate it. 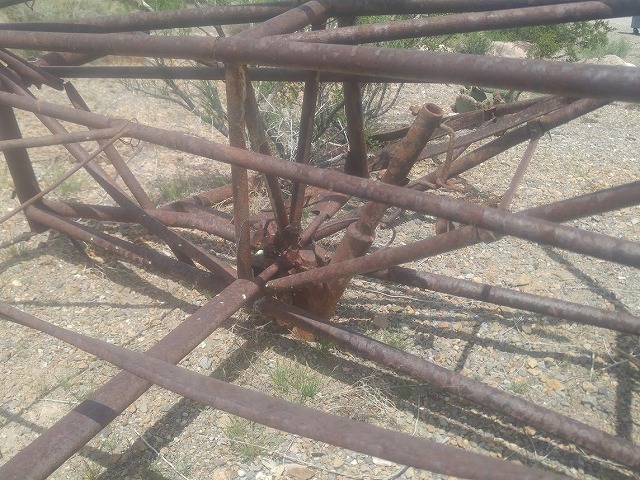 There was no tail wheel, but the gear was still there. I really didn't figure out how the tail wheel mechanism works.